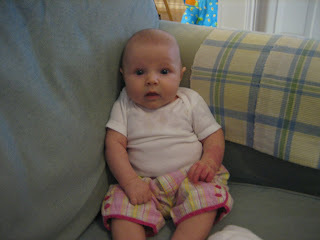 Last night, Andrew had a brilliant idea: why don't we try cloth diapers for Holly? The thought of spending oodles of money on disposables (especially when the time comes when we have 2 kids in diapers) is not appealing to either of us, especially since I'm not working. I thought it was genius and set to work researching cloth diapers online. This all happened around bedtime, and when I get a new idea I cannot sleep. Therefore, I was up until 1:00 a.m. looking at diaper options. Um, hello? 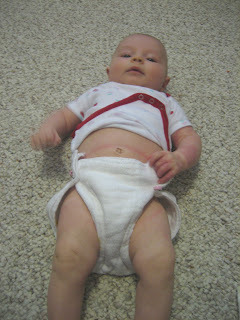 I'm sure you can see the obvious problem here: the diaper is way, way, way too loose! I actually used 2 diapers because they are not very absorbant, thinking that 2 must be better than 1, right? Right? 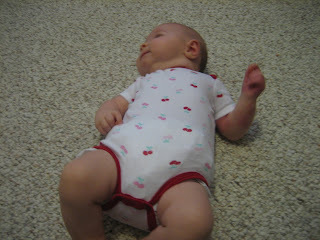 After I folded the diaper nicely I put Holly on it and had to wrap it around her and then fasten it with diaper pins. Uh-huh, that's right. Diaper pins. 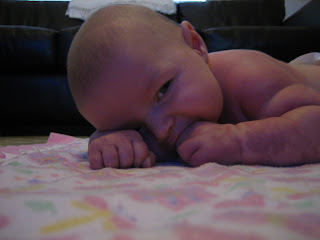 Which were terrifying because sharp objects and squirmy babies definitely do not mix. I almost had a heart attack when Holly almost grabbed the pin in her fist and then flailed and kicked the entire time the pin was exposed. 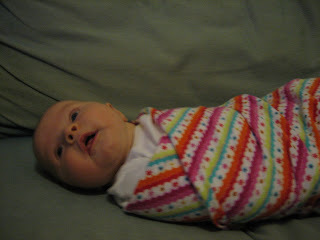 Once I got the diaper on, I put on the cover and got her dressed. I know this is not a flattering photo of her, but I wanted to emphasize how bulky and silly she looked. I mean, the onesie barely snapped over the two diapers and the cheap plastic cover. (I didn't want to invest too much up front in case things don't work out--if they do, I will get some better equipment.) I laughed out loud when I saw how funny it looked. Then she was in the thing for about 5 minutes and then guess what? She pooped. As you can probably guess, the cloth diaper leaked all over inside the diaper cover, but at least it was contained. Yikes. Anyway, all the rest of the diapers are still in the washing machine so I put Holly back in a disposable diaper for now. The chubs! I love it! 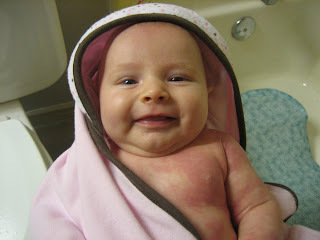 Last night, we were giving Holly a bath and had to take some pictures of her post-bath wrapped in her cozy towel. 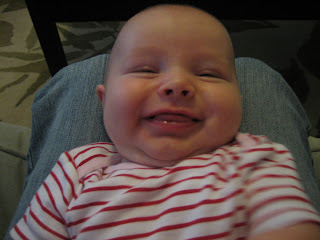 She saw the camera and started smiling! It was a cute, shy smile. She was totally ready to oblige and cooperate with the photo shoot. One of her happiest times is in the bathtub and when just getting out of the bath. Would you believe that a mere 10 minutes after this picture was taken, she had the biggest tantrum (crying spell, fit, whatever) of her life? Yes, that's right. Someone kidnapped our sweet, mild-mannered baby and replaced her with a monster who cried, no SCREAMED, for 45 minutes straight. Why, you ask? No idea--from our perspective, it was completely unprovoked. We had no idea what to do. It was crazy. 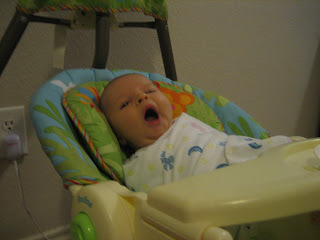 I have never had to deal with a baby who literally screamed herself hoarse before. It was a little frightening. Anyway, after Holly's fit was over, we were all exhausted (Andrew and I from passing her back and forth; Holly from crying). Luckily, Holly went pretty much right to sleep after that--who wouldn't?--and slept for five hours. Thank goodness! I am happy to report that our sweet baby was back again this morning. Hopefully we will not have a repeat visit from that demon baby ever again. Other goings-on at the home front: I am really getting started on food storage! I'm really excited about it and Andrew is (reluctantly) indulging me and letting me jump headfirst into this and probably get very overwhelmed. My goal is to get a year's supply of GOOD food and actually live from it and, yes, rotate our food storage. This means cooking from scratch every day, baking bread, and eventually canning my own fruits, veggies, and meats. Am I crazy? Possibly. But if my plan works, I will be saving our family lots and lots of money, feeding everyone more nutritious foods, and obtaining a generous year's supply of food! My first step this morning was to go up to the attic (yes, the attic) and get down our little food storage that we do own--a couple of cans of wheat, rice, oats, etc. Next I'm going to rearrange our pantry and purchase...a wheat grinder! So I can make lots of yummy things out of our wheat and other grains I've started stockpiling. I will make updates on my misadventures of breadmaking and other experiments. Yesterday (okay, okay, AND Thursday) I wasted at least a few hours online looking at crafting and sewing blogs. 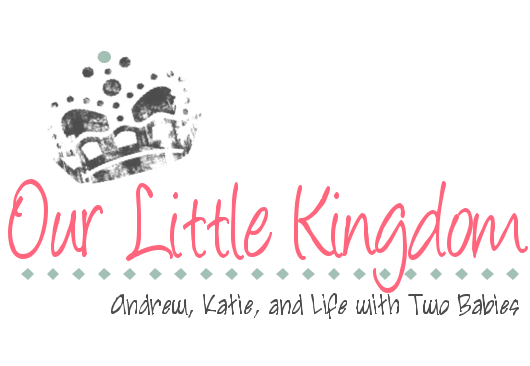 My sewing machine is now fixed, so I have been looking for projects to do! And neglecting my poor daughter at the same time. :) Please tell me that I'm not the only one who does this! I now have a long list of projects for Holly and for myself. I can't wait!